Wheels for the Jeep Wrangler are machined to match Wrangler's hubs exactly. They don't rely on lug nuts to be centered, so they will run true and balance easily for a smooth ride. 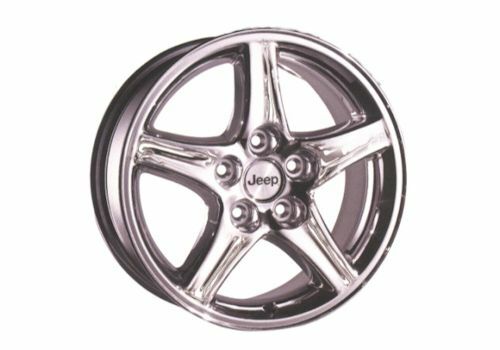 On both polished and chromed Jeep wheels, the surface is a heat-cured acrylic clear coat finish that will retain its bright appearance without tedious re-polishing. All wheels are designed to meet Chrysler's strength, corrosion, and balance standards. Wheels are sold individually. Item # 82205897 - 15"x8", 5-spoke, Chrome plated, with Jeep logo center cap.